Group Discussion Ideas > General GD Topics > Swachh Bharat Abhiyan – How far was it successful? 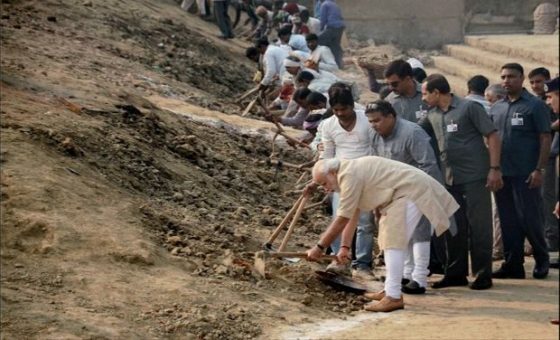 Swachh Bharat Abhiyan – How far was it successful? Gandhiji once said, ‘Sanitation is more important than Independence’. Nearly half of the population of India defecate in the open. On 2nd October 2014, ‘Swachh Bharat Mission’, the biggest ever cleanliness drive was launched to ensure hygiene, waste management & sanitation in India. It aimed to eradicate open defecation by 2nd Oct 2019 as a tribute to Mahatma Gandhi on his 150th birthday. Through this program, govt builds toilets and community toilets for schools, houses and public places. SBA is a centrally sponsored scheme. Funding for this program was set as 2 lakh crore. For North Eastern & Special category states, funding will be in 90:10 ratio by center and state. And for all other states, funding will be in 75:25 ratio. World Bank approved $1.5 billion to support SBA. 2% Swachh Bharat Cess is being levied on all taxable services. Companies can contribute to this program through ‘Corporate Social Responsibility (CSR)’. 100 Iconic heritage, spiritual and cultural places including ‘Taj Mahal’, ‘Golden Temple’, ‘Ajmer Sharif Dargah’ to be cleaned up under Swachh Bharat Mission. As per Government reports, as of April 2016, more than 1.5 crore household toilets, 65,108 community toilets and 11,705 public toilets have been constructed and 2.29 crore household toilets are still under construction. Toilets and dustbins will be setup for every 500 metres in cities. The issue of sanitation and the unhygienic conditions in India came into limelight and are recognized. This is the biggest step towards the Clean India. It gives dignity to the cleaning staff. This program has dedicated staff to conduct awareness programs and to work towards behavioral change. Public health will be improved. Many waterborne diseases like Cholera, Malaria, Dengue etc. can be prevented. Healthcare costs will be reduced, thereby contributes to GDP growth. People have a tendency to throw garbage on the dirty areas. Once all the public places are clean, no more dirty areas will exist. To manage solid waste, electricity is being produced from it. Maharashtra govt introduced Anti-spitting law. There are no proper dust bins are available in the public places still. Apart from the media appearances, almost no one attempts to clean public places. Till the problem of slums is solved, SBA cannot be successful to the full extent. Swachh Bharat Abhiyan is indeed successful in acknowledging the unhygienic conditions in India. Instead of ignoring the sanitation issue, working towards the clean India is undoubtedly a good thing. Though the target seems unbelievable by 2019, the problem of open defecation will be reduced to a great extent by then. That’ll be enough to call this program successful. Afterwords :- What is your take on this topic? Do you think ‘Swachh Bharat Abhiyan’ is successful? Share your opinion in the comment section below. SBA.The Dream of Mahatma Gandhi is not far away.Cleanliness Comes from bottom level not by implementing in the Parliment. Though it was aimed on 2nd Oct,2019 Lets take few more years but we must see Clean India with Doing,Not only by the words. First and Biggest step in SBA is eradicating Open-Defecation. Few states are remained saying that “Our State is Completely Defecation Free now”. Govt.is efforting in its possible ways to make INDIA Clean And Beautiful.Largest transport system of India”INDIAN RAILWAYS”is the best example. BIO-Toilets,Dustbins,the messaging pictures on the walls throughout the Station, Beautification of the stations, awards given to the best implemants etc. Not only in railways every where we can see the changes with cleanliness. Its the first duty of citizens then the government . It may take time but we will definitely going to see A Clean and Neat India. It is more important to make our own country neat and clean,if not then we are the suffers. Plz everyone kindly come out of your house, just clean the roads for a day and try to remember that you are also an Indian. It is not by law, but attitude and lack of awareness, people keep their environment ugly. If everyone has civic responsibility and consciousnesses , our place can be neat & clean. Spiritual strength may promote cleanliness . Yes! Everyone should respect their duties as much as they fight for their rights. According to me swachh Bharat Abhijan is a very good step but it will take time to make it successful, still many people they relieve openly . It requires strong awareness to make them understand it is harmful for their health and unhygienic. Though Govt. Working to set up toilets in poor peoples houses and public places. But common people they have to change their mentality not only they have to clean their house as well as they have to clean their area. If we common people take the responsibility to set up a committee and they will take care to clean their own area and nobody get courage to make the place dirty then make it successful. I have seen in the city area people living in the high-rise buildings they thrown up their garbage from upstairs to on the road ,this is not fair ,they have to leave their garbage in the particular place,so strong awareness is required to change the mentality then make it successful. That’s a great idea! Committees by local people will fasten the process of Swachh Bharath. The success of any plan or any scheme depends on its implementation.The way the SBA has been launched and the awareness about cleanliness has been disseminated are appreciable but the results are not as were expected because of ignoring behaviour of public.This campaign will be fruiteful only after a slew of efforts by government as well as by public as it is not the sole responsibility of government. Agree most part, lived in India in sixties. Town lived in was developing with government funding’s. there were regular information in media, plans may have been made also and may be safely kept in files as work completed though not and funds milked by authorise officer. Time to discard such officers with their wealth anywhere in the world be returned to origin. Awareness and strict laws can be proven contributing factors in clean India campaign. A huge campaign can never be successful by the govt only, it needs contribution of every individual. So, instead of blaming the policies of govt we need to strive in order to achieve this goal. Everyone knows that the littering is not a good thing but only knowing does not works. we need to apply this in our day to day life.. we should point out the person who is littering in any way.. like spitting, peeing, throwing garbage in public area etc. And the govt should fine such people on the spot. It will create a fear as well as responsibility among such people to keep our surroundings clean. It is must to put the dustbins everywhere so that people can throw the garbage in it. some small campaigns should also be conducted at lower level and appoint ambassadors and reward the people contributing towards the campaign. true, laws are there but depends on honest personal on duty. Yes, I think that SBA, is successful upto some extent to create a clean India..but It needs a continuous efforts..
yes, sba is success, if we support this program and create a beautiful and clean india. So, my friends lets start a journey to clean india. Nothing is impossible! I think if we are keen to keep our environment clean we can make it happen. For some people who doesn’t want to follow, introducing strict laws might work where people should be fined for making places dirty. Also teaching children about benefits of clean environment in the school as a subject will definitely bring change in near future. I find the most dirty place near the vegetable and fruit seller, where whole lot of rubbish is thrown on the road, the vendors should be given big bins to put their rubbish and rules should be made for them to follow. So, why not hope for the best? It is unsuccessfull. Unless otherwise we educate people on many of the things and have a control and strict laws punishing those wrong doer’s its not at all possible.